Book Soup: Deborah Klein in conversation with CEO Allison Hill. My name is Allison Hill, and I am the President and CEO of Vroman’s Bookstore in Pasadena, California and Book Soup in West Hollywood, California – both in the Los Angeles area. I’ve been in the book business for about 25 years. What is special about the bookshop Book Soup? Book Soup is a magical place. It was founded in 1975 by Glenn Goldman who imagined a general bookstore that specialized in art, music, film, fashion, photography, and literature to inspire the creative community in Los Angeles. Since then the bookstore has become legendary—its floor-to-ceiling bookshelves, its maze of black shelves, the gold dog statues that guard the front door, and 65,000 carefully curated titles and objects d’art. 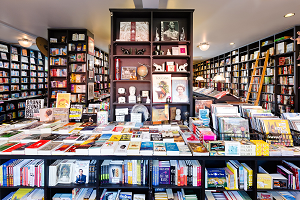 The store frequently appears on lists of the best bookstores in the U.S. and the world’s most beautiful bookstores. Glenn passed away about 10 years ago and Vroman’s Bookstore, another independent bookstore, bought Book Soup to keep it alive. I worked for Vroman’s at the time but had previously been the general manager at Book Soup for almost seven years. It was a labor of love for everyone involved to ensure that Book Soup lived on. The store itself is the same as it always was; Vroman’s just provides the back-office support. What significance does the location on Sunset Boulevard have for your store? Book Soup’s location has contributed to its legendary status. Surrounded by famous music venues and bars, Book Soup is the heart of the world-famous Sunset Strip. How would you describe your clientele? What is the unique about it? The store is frequented by artists, writers, directors, actors, producers, visual artists, musicians, tourists from all over the world, our West Hollywood neighbors, and book lovers. We have “regular” customers who live in New York, France, Australia, and Japan, as well as all over Southern California. Would you describe America as a reader-friendly country? Yes! The United States is a reader-friendly country. There are still hundreds and hundreds of independent bookstores, and their numbers are on the rise. There are also dozens of huge book festivals around the country. What is important to readers when buying a book? Which trends can be seen here? I think readers just want a good story, an engaging narrative, character arcs, language that propels the narrative forward. I know many of my customers are interested in a greater diversity of authors and characters—multicultural children’s picture books, for example. And I often get requests from customers looking for books that will make them laugh out loud, which speaks to the need for books as an escape in challenging times. What kind of mood do customers find in the shop and how do you create this mood? Music is a big part of the Book Soup experience. Booksellers act as DJs choosing the music for the day and it is definitely not typical bookstore fare. At any given moment, you might hear punk rock or classic country or something by one of our customers. The music energizes the store and speaks to our place on the Sunset Strip. Book Soup is all about discovery. That is obviously demonstrated in the book and gift selection but also in the decor. There are elements of whimsy and surprise throughout: the two gold dog statues, a metal sculpture of a cowboy on a bucking bronco, secret compartments hidden around the store, a mobile action figure of the founder, original artwork by local artists, and so on. Our window displays are legendary thanks to our designer-in-residence Rob Bieselin. Right now, we have writers writing in our window for the month of November. It definitely stops passersby in their tracks! He’s done a post-apocalyptic theme, an interactive Twitter display, and a poignant political window that took on the topic of race. All of these inform the unique and legendary spirit of Book Soup. What role does Los Angeles play in literature? Los Angeles has the biggest book-buying market in the country. We have one of the biggest book festivals—the Los Angeles Times Festival of Books with 100,000 attendees—and extraordinary bookstores, including a few that show up on many of the “Best Bookstores in the United States” lists. The film and television business in Los Angeles also drives a significant interest in books as it seeks stories to turn into television and movies. Historically, Los Angeles has a long, rich literary tradition with well-known American authors such as Charles Bukowski, Ray Bradbury, and Raymond Chandler. L.A. institutions like Musso & Frank Grill (a Hollywood institution since 1919) and The Roosevelt Hotel (a Hollywood institution since 1927) have served as watering holes for the greats, such as Dorothy Parker, F. Scott Fitzgerald, Nathanael West, and Lillian Hellman. How would you describe the future role of the printed book? Ten years ago, I worried about the future role of the printed book, but I don’t worry anymore. I think future generations will be hybrid readers, toggling between print and digital, and perhaps some new technology we can’t imagine yet… But I do believe that the printed book is here to stay. Many people still value the feeling of a book in their hands, the sensation of turning the pages, the smell of ink on paper, the act of browsing the shelves, and the experience of being in a bookstore sharing books with fellow readers. Which book would you like to recommend to readers? And why? 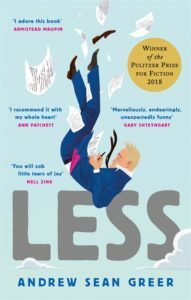 Less by Andrew Sean Greer. This extraordinary novel is one of the best I’ve ever read. It was not surprising when it won the Pulitzer Prize a couple of years ago. The story revolves around a trip around the world by a failed novelist on the verge of 50 who is running away from his problems. It is charming and funny and fresh and poignant—so well written; I dogeared pages with lines that took my breath away and my whole book is tattered. I also love recommending anything by Haruki Murakami. I consider Murakami to be the universal language of booksellers. I can go into any bookstore around the world and find a bookseller who loves his work as much as I do. Last question: Is it true that well-known authors also like to stop by spontaneously to sign their pile of books? On any given day, there is a good chance you’ll see a famous author at Book Soup. It is a common occurrence to have authors stop by the store to sign their books, and it is not uncommon to see famous authors, artists, celebrities, or rock stars browsing the shelves looking for inspiration. Fortsetzung gefällig? Book Soup ist auf Instagram und der Homepage zu finden.